If you are a dog lover coping with the diagnosis of dog cancer, at some point you will be forced to deal with costs. In this economic climate, many are faced with heart-wrenching decisions. Are these familiar to anyone out there? The situation in veterinary medicine is many times different from human medicine. When dealing with a veterinarian, the issue of cost must always be addressed. And cases of cancer care often require extensive surgery, chemotherapy or radiation. Many have to deal with a price tag of $4000-10,000, and sometimes even more. An article I came across described a Golden Retriever, Comet, who was afflicted with lymphosarcoma. Comet received an experimental stem cell transplant procedure in 2005, to the tune of $45,000. These figures can be utterly overwhelming for a typical person, especially these days. This situation produces guilt, frustration, anger and worry. Many feel hopeless and lonely, crushed by the idea that there is no way out. In truth, the cost of care is one of the toughest things about a dog cancer diagnosis. How in the world is one supposed to deal with it? The most important thing is to communicate with your veterinarian. I have had concerned dog lovers assume that there is only one option, only one way to treat based on a single approach presented by the vet. This is usually not the case. Your veterinarian or oncologist, many times, will be able to present an option or two that is less costly. Don’t be afraid to be your dog’s primary health care advocate! Discuss the situation with the doctor managing the case. Be honest and open. Many times a compromise attack plan can be reached. Many veterinarians offer outside financing like Care Credit or Chase Health Advance. These are companies that will take over the bill, allowing dog lovers payment installments. If your veterinarian does not offer these options, suggest they consider it! Everyone wins. Charitable organizations exist that may help defray the cost of treatments. 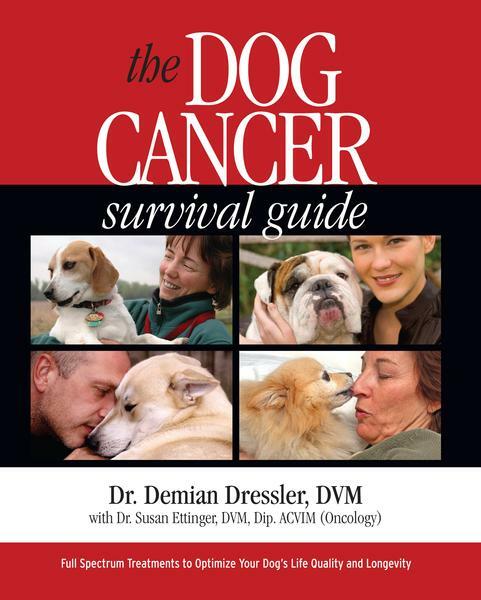 There is a list of these in The Dog Cancer Survival Guide. Incidentally, due to these “ruff” times (sorry, bad pun), the cost of this immediate download e-book has been reduced to help you get the information you need to help care for your loved dog. For those close to larger veterinary cancer facilities like vet schools or referral hospitals, enrolling your dog in a clinical trial may be possible. These centers provide low costs of care in exchange for the benefit of research that can help all dogs. A good place to start is the Comparative Oncology Trials Consortium, or the COTC. This is a network of facilities involved in active dog cancer clinical trials. For other searches, target the vet school Dean’s office or the oncology section of small animal medicine. Referral hospitals also have oncology sections that may help. I am just beginning the long Dog Cancer battle with my yellow lab mix, a gentle, sweet soul who just turned 9 this month. He has mast cell tumor on his right leg and it is in his lymph nodes as well. We see the oncologist for the first time in a couple days. I will need to face reality I know but I will try all that I’m able that won’t make my little guy horribly sick or cause him great pain over an extended period. He is on the cancer diet, I’ve ordered Apotaps, K9 Immunity, and some digestive enzymes to help him battle the cancer. I just don’t know how I’m going to say good-bye to my sweet boy. I’m sorry, I know so many go thru this. Such incredible heartache. I have pretty much come to a conclusion and a philosophy about dogs with cancer: I have rescued many dogs in my life and have taken care of all of them very well. I had two dogs get cancer and they both died this year. They were older thank goodness or my decisions could have been different. There are many dogs that need a home. There are so many languishing in cages in shelters without much human contact. I have decided that since I have given the dogs I rescued a chance at a good life ( they have lived from 10 to 18 years) I will have to make the decision to NOT spend thousands of dollars on a single dog. I will however, take the best care I can of the dog that has cancer, providing the best comforts, diet and supplements and if i read a new post about a new treatment, I will try it, but since I have seen so few good reports after owners have spent so much money (the dogs still have problems or die anyway) after sometimes thousands of spent dollars. Give your dog the best care without spending so much money. There are many other dogs who need a place to live. I know I will be seen as cold. I have loved every one of my dogs I rescued and I will not discount the bond between a dog and his/her guardian, but I understand the financial limitations and the realities. I respect their life and I have respected their death and I will now be OK with a good death rather than an extension of a poor quality of life. My reaoning too is that I have more than 1 dog I care for at a time. Those individuals with only one dog will probably feel differently and will not spare any costs. I understand this philosophy as well as I was like that at one time. Just don’t see too many good outcomes given the money spent. I wonder what the current status is on the dog given the stem cell transplant. It was an interesting story–ahhhh how nice to have money and the connections to the right people. This article was from 2005 and wonder how Comet did long term. Of course I wonder if the people with all the money also sprayed their grass with weed killers and herbicides and fertilizers which is known to cause this kind of cancer—- After having gone through all that–to then have Comet rolling around in chemicals. Thank you Dr. Chambreau for bringing immediate attention to this important matter that prevents most of us from having choices and options available. I had to do the humane thing with my ten year-old Katie just this past June due to upper jaw bone cancer. That had to be the single most difficult thing I ahve ever had to endure! My Father’s death and my divorce combined did not cause the anguish that I suffer daily as much as losing my Katie did. I heard a holistic vet on XM radio today on the Martha Stewart channel and she hit the nail on the head when she said any dog lover understands the loss we feel even above and beyond loss of a human. That is so true! Please help change this demise we face so everyone has a chance to help save their beloved dog!!! Another suggestion is to invite people to contact veterinarians and care givers in advance, if possible, and ask to barter. Maybe you can clean the parking lot, do some on-line promotions, file folders or distribute promotional flyers if you do not have specific skills like accounting or massage. The issue of funds to care for animals in need was addressed at the Second annual Veterinary Hospice conference this Labor Day Weekend, 2009.